Since Harry Potter and the Philosopher’s Stone was first published in 1997, there have been countless different covers created for J.K Rowling’s treasured books. As we entered into the technological age, graphic artists had the chance to recreate original book covers for the launch of their respective ebooks. Here, we take a look at the work of talented graphic artist Olly Moss, who’s website can be accessed here. UK illustrator Moss was commissioned by Rowling’s website Pottermore to create covers for the release of the first ebooks series back in 2015, and has recently been granted permission to release a host of unpublished, never before seen alternatives and they are FIRE. The chosen series of covers were called “Optical Illusions” for the digital release. The other possible series for selection are called Heraldry, Sillouhettes, and Hogwarts. Each book is represented by a simple, colorful icon. Designed to look distinctive at a distance and even in black and white, when looked at closely, each heraldic icon also incorporates a Harry potter lightening bolt. Icons include Hedwig for the first book, Aragog on the cover of the Chamber of Secrets, a Hungarian Horntail takes the cover of Goblet of Fire and Marvolo Gaunts ring graces the cover of the Half Blood Prince. Each installment of Sillouhettes shows Harry’s head in profile and each showcases a different scene from each book contained within it. A lovely touch added by Moss is the aging of Harry’s head as the books go on. These covers are my favorite, with each showing Hogwarts from the same angle and using the same composition of the castle in each. What differs from cover to cover is a seasonal change and a different mode of transport taken by the characters to the castle at the start of each book. They’re so well thought out and very touching graphic art, also. 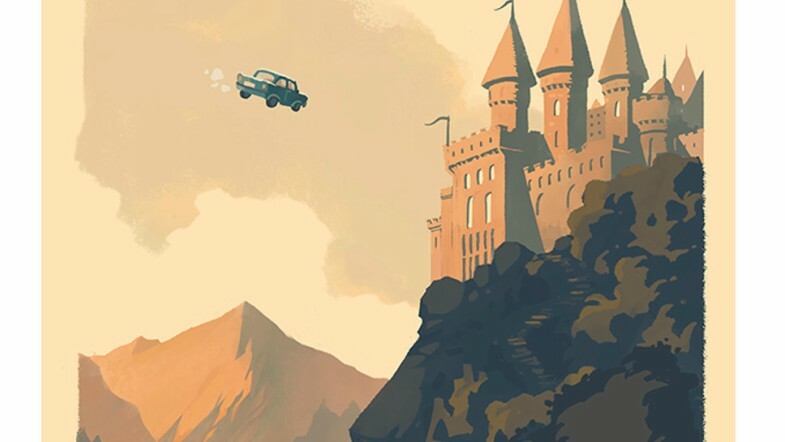 Olly Moss I take my wizarding hat off to you. 10 Austen-tatious Gifts for the Jane Austen Fan in Your Life!